The Trump administration announced on February 1 that the country was suspending its participation in the Intermediate-Range Nuclear Forces Treaty (INF treaty) for 180 days pending a final withdrawal. 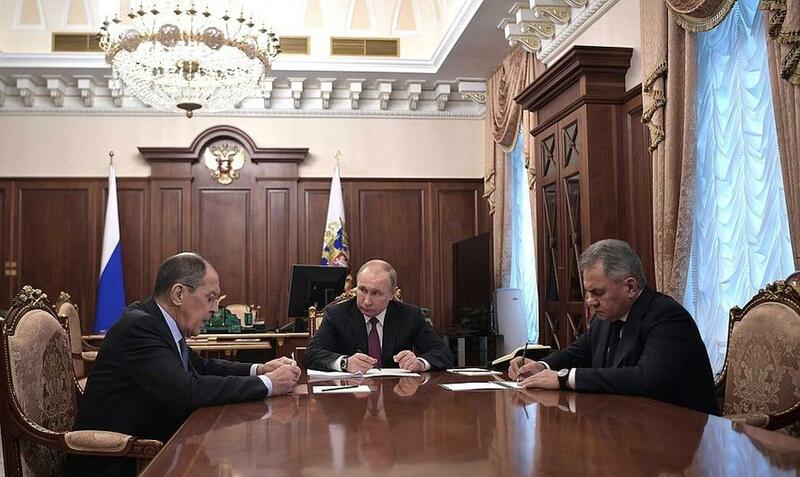 Vladimir Putin, in a meeting with Foreign Minister Sergey Lavrov and Defence Minister Sergey Shoygu, announced on Saturday that the Russian Federation is also suspending its participation in the treaty in a mirror response to Washington's unilateral decision. The INF treaty was signed by the US and the USSR in 1987 at the height of negotiations that had begun years earlier and directly involved the leaders of the two countries. The treaty entered into force in 1988, eliminating missiles with a range of 500-1,000 kilometers (short to medium range) and 1,000-5,500 km (intermediate range). The treaty has always concerned land-based launchers and never sea- or air-launched missiles, a legacy of a bygone era where most nuclear warheads were positioned on missiles launched from the mainland. In subsequent years, thanks to technological advances, solutions like submarines, stealth bombers and the possibility of miniaturizing nuclear warheads became increasingly important in the military doctrines of both the US and Russia, nullifying the basis on which the INF treaty was initially signed, which was to avert a direct confrontation between Washington and Moscow on the European continent. The INF treaty, together with the Strategic Arms Limitations Talks/Treaty (SALT treaty), signed by Washington and Moscow on the issue of long-range missiles, aimed to create a safer global environment by seeking to avoid the prospect of a nuclear exchange. It was also aimed at reducing the number of nuclear warheads owned by the US and the USSR, as well as generally reducing proliferation in line with the Non-Proliferation Treaty (NPT). In particular, the INF treaty guaranteed a lasting peace on the European continent through Washington not deploying nuclear weapons in Europe aimed at the USSR and Moscow in turn not deploying systems capable of eliminating these European-based US missiles. The initial promoters of an INF agreement were obviously the European countries, who would have found themselves in the middle of a nuclear apocalypse in the event of war between Moscow and Washington. With 1970s technology, the time between the launch and impact of a missile with a range of 500-5500 km was about 10-12 minutes; that was the amount of time Moscow and Washington’s leaders had during the Cold War to decide whether to retaliate and thereby launch WWIII. With today’s technology, the time to decide would probably be reduced to less than 5 minutes, making it all the more difficult to avert a nuclear exchange in the event of an accident or miscalculation. The INF treaty was thus a life-insurance policy for humanity that decreased the statistical probability of nuclear provocation or of an accident. During the Cold War, the concept of mutually assured destruction (MAD) was central to the nuclear doctrines of the two great powers. The INF treaty served the purpose of taking concrete steps towards greatly reducing the possibility of mutually assured destruction. With the unilateral withdrawal from the treaty by the US, all these safeguards and guarantees are lost, with all the consequences that ensue from such a reckless as dangerous act. The American and European mainstream media have applauded the withdrawal from the INF, in the same way that they have applauded Trump whenever he has been pro-war. Former CIA and military personnel, as well as the former CEO’s of major arms manufacturers, have been eager to share their views as “experts”, literally invading television programs and thereby showing why they are paid lots of money to lobby for the military-industrial complex. They praised Trump’s move, blaming Moscow for the ending of the treaty, but in the end revealing the covert geopolitical reason why Washington decided to end the deal, namely, the fact that China is not bound by the same treaty. These vaunted experts on MSNBC, CNN and Fox News alluded to the danger of Washington being bound by such a treaty while Beijing was not, thereby limiting Washington's options in the Asia-Pacific. Trump and his staff view the INF treaty as an intolerable imposition that ties America’s hands in its efforts to contain China. US foreign policy, especially under this administration, sees every kind of agreement, past or future, as a concession, and therefore a sign of weakness. Trump and his generals drafted the National Defense Posture, stating that the time of great-power competition is back and that Washington’s peer competitors were Moscow and Beijing. The return of great-power competition is an excuse to “strengthen the military”, as Trumps loves to say, and his decision is in line with the new defense posture review Trump approved, seeking to confront every adversary in any domain by all means. The newly announced Space Force is a reflection of this, seeking to put weapons in space in violation of all existing treaties. At the same time, the development of tactical nuclear weapons also expands the use of nuclear weapons in certain circumstances, pushing the envelope on the prohibition on the use of nuclear weapons. These new programs will end up draining even more money from taxpayers to fill the coffers of shareholders, CEOs and lobbyists for the big arms manufacturers. To justify the withdrawal from the INF, the military-industrial complex, which drives US foreign policy, needed a suitable justification. Of course in a time of anti-Russia hysteria, the choice was obvious. Since 2014, the attention of so-called US experts has been focused on the 9M729 missile in particular, an evolution of the 9M728, used by the Iskander-K weapons system, a Russian technological gem with few equals. NPO Novator, the company that produces the 9M729, reassures that the missile does not violate the INF treaty and has a range shorter than the 500 km limit (470 km). Moscow even organized an exhibition open to the public, with the missile on display along with its main features, inviting Washington to officially send its experts to view the characteristics of the 9M729. Washington refused, knowing full well that the missile does not violate the the INF, preferring instead to use the 9M729 as an excuse to abandonment the treaty. Washington will suspend its participation in the treaty within 180 days, and Moscow has responded with an identical measure. With hysteria surrounding Russia (Russiagate) and the impossibility of Trump and Putin engaging in dialogue following the complete sabotaging of relations between Moscow and Washington, it is almost impossible that a fruitful dialogue can be created to seal a new agreement in the remaining 180 days. This, however, is not even the basic objective of the Trump administration. Unofficially, Trump says that he would rather include Beijing in the agreement with Moscow. But knowing that this goal is impossible to achieve, he is pursuing his broader objective of withdrawing the US from all major treaties, including the INF treaty. In the specific case of withdrawing from the INF, there is little need to raise a big hue and cry as was the case with the Paris Agreement, as the media-intelligence-military apparatus has a lot to gain from this. This just goes to show how the MSM and their rolled-out “experts” thrive on war and the money that is to be made from it. There is a major psyop going on to convince the American public that the withdrawal from the INF treaty, and the resulting arms race with major nuclear-armed countries, is apparently the best way to keep America safe! The withdrawal from the INF treaty opens the gates for a new nuclear-arms race that will bring great advantages to arms industries, with great returns for shareholders, executives and CEOs, all paid for by the American taxpayer. It is more than probable that the official defense budget in 2020, having to cover for the development of weapons previously prohibited by the INF treaty, could be more than 800 billion dollars, seeing an increase of tens of billions of dollars in the space of 12 months. The unilateral withdrawal by George W. Bush from the Anti-Ballistic Missile Treaty (ABM Treaty) in 2002, citing the need for the US to protect itself from countries belonging to the Axis of Evil (Iran, Iraq, North Korea), was an excuse to deploy the Aegis system (land- or sea-based) in strategic areas around the Russian Federation, so as to diminish Moscow’s deterrent capacity for a nuclear second strike. The Aegis Ballistic Missile Defense System (Aegis BMD) is designed to be able to theoretically intercept Russian missiles in their initial boost phase, the period when they are the most vulnerable. Moscow has been openly questioning the rationale for the Aegis system deployed in Romania. According to Russian military experts, the possibility of reprogramming the system from defensive to offensive, replacing the conventional warheads used for intercepting missiles with nuclear-tipped cruise missiles, could be undertaken within an hour, without the Russian Federation possibly being aware of it. Putin has cited this specific case and its technical possibility more than once when pointing out that the US is already in violation of the INF treaty by deploying such systems in Romania. The US unilaterally withdrew from the ABM treaty in 2002 in order to be able to disguise the deployment of an offensive system under the guise of an ABM system for the purported purposes of defending against Iran, thereby de facto violating the INF treaty, an excess of arrogance and presumption. Such perfidy caused Putin to make his famous 2007 Munich speech, where he warned the US and her allies of the consequences of reneging on such treaties and agreements. Deploying defensive systems close to the Russian border that can easily be converted into offensive ones with a nuclear capacity was a red line that could not be crossed. At the time the West ignored Putin's warnings, dismissive of the Russian leader. But only a few months ago, the Russian Federation finally showed the world that the warnings issued in 2007 were not empty bluster. Hypersonic weapons, a submarine drone and other cutting-edge systems were presented by Putin in March 2018, shocking Western military planners and analysts who had not taken Putin seriously back in 2007. These new technological breakthroughs provide Russia with the ability to eliminate targets by kinetic, conventional or nuclear means. Such offensive deployments near the Russian border as the ABM systems in Romania can now be eliminated within the space of a few minutes, with no possibility of being intercepted. Putin has already put his military cards on the table, warning 10 years ago what would happen if Washington continued in its duplicitous direction. As Putin said in March 2018: "They did not listen to us in 2007. They will listen to us now". The consequences of withdrawing from the INF treaty fall most heavily on the shoulders of the Europeans. Federica Mogherini indicated deep concern over Washington’s decision, as well as the new super-weapons that were either being tested or were already operational in Russia, causing consternation amongst the Western military establishment that had thought that Putin was bluffing in March 2018 when he spoke about hypersonic weapons. The US military-industrial complex is rejoicing at the prospect of money rained down as a result of this withdrawal from the INF treaty. But in Europe (with the exception of Romania and Poland), nobody is too keen to welcome US missiles that have no defense against Russian hypersonic weapons. NATO's trans-Atlantic arms lobby will try to push as many European countries as possible towards a new Cold War, with US weapons deployed and aimed at Moscow. It will be fun to see the reactions of European citizens facing the prospect of being annihilated by Russian missiles simply to please the CEOs and shareholders of Lockheed Martin and Raytheon. No doubt there will be some European politicians in countries like Poland keen to scream about the “Russian threat”, ready to throw tens of billions worth of Polish taxpayers’ money into useless and ineffective projects for the purposes of pleasing their American friends. Are US generals even aware of how idiotic it is for the US to withdraw from the INF for Washington? Moscow is already ahead in the development of such systems, both land-based but above all sea- and air-launched, without forgetting the hypersonic variants of its conventional or nuclear missiles. Washington has a huge gap to close, exacerbated by the fact that in spite of heavy spending over many years, there is little to show for it as a result of massive corruption in the research-and-development process. This is not to mention the fact that there are few European countries willing to host offensive missile systems aimed at Russia. In reality, there is little real advantage for Washington in withdrawing from the INF treaty, other than to enrich arms manufacturers. It diminishes US military options strategically while expanding those of Beijing and Moscow, even as the latter oppose Washington’s unilateral withdrawal from the treaty. The hope of expanding the INF treaty to include the US, Russia, China and the EU appears slim due to Washington’s intransigence. Washington only aims to increase expenditure for the development of weapons prohibited by the treaty, and in strategic terms, improbably hopes to find some Asian and European countries willing to host these systems aimed against China and Russia. The world is certainly more dangerous following Washington's decision, heading in a direction where there are less and less rules while there are more nuclear powers. For decades, the United States has been trying to achieve nuclear supremacy by overcoming the limitations of MAD, whereby Washington would be able to carry out a decapitating nuclear first strike without worrying about an opponent’s ability to launch a retaliatory second strike. It is precisely this type of thinking that is bringing humanity closer to the brink of destruction from a nuclear accident or miscalculation. The miniaturization of nuclear warheads and the apparently limited nature of “tactical nukes” further encourages the justification for using such weapons. Moscow's decision in 2007 to develop state-of-the-art weapons and focus on new technologies like hypersonic missiles guarantees that Russia and her allies have an effective deterrent against the attempts of the US to alter the nuclear balance of power, which otherwise threatens the future of humanity. The withdrawal from the INF treaty is another worrying sign of the willingness of the US to push the world to the brink of catastrophe, simply for the purposes of enriching the CEOs and shareholders of it arms manufacturers through a nuclear arms race.